In this series we take a look at state championship and runner-up coaches, their outlook on the team, the season, and 2014. Coach Frankie Ruiz has been the leader of a powerhouse Belen Jesuit program for the last twelve seasons, and was an assistant for four before that. 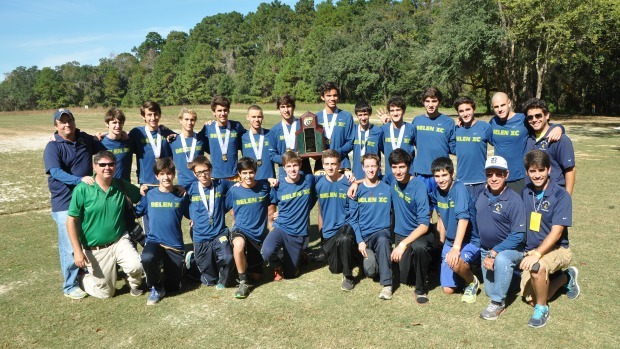 In his time the Wolverines have won seven cross country championships including their most recent this year. What kind of training did your team get in over the summer months leading into the season? We followed our usual summer training program, which includes a focus on team building and quality mileage. We culminated our training during the summer with a trip to Eugene, Oregon to train for 10 days. 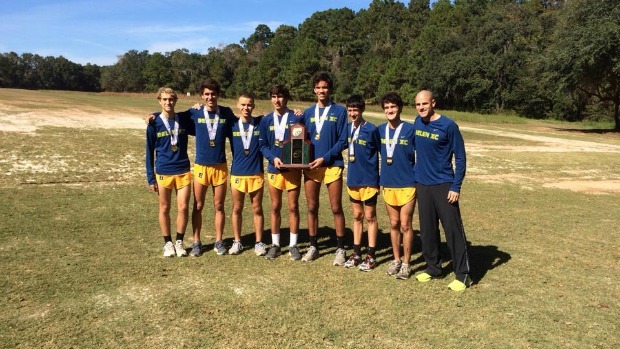 How did you train the team in the final weeks leading up to the state meet? We adjusted our training this season about midway to accommodate some injuries, but towards the end of the season we did little to taper instead we trusted in a combination of formulas used in past seasons. The only change as we got closer to state was that we fine tuned the minor details that historically help us close our gaps and bring down our team average. Many of our drills centered around trusting in one another's performances. What chances or belief did you have in your team's chance and ability to win the state title? I did my best to reflect their own demonstrated belief. This belief only grew stronger as they gained confidence from the workouts and a few key races throughout the season. We always remind the guys to take on every team with the utmost respect while never doubting our own abilities and capabilities. They know that if they work hard all season long that their chances will be as high as every other team that did the same. It is certainly a big help to have won the state championship the prior year because that helps prove the possibility. Our main point of emphasis is no different than what we emphasize all season long, which is to run the way they train and train the way they want to run at the race. We made it a point all season long to build depth and instill confidence in that depth so that the week of state nothing new would need to be added to the message on to meet the set objective. The race plan was to run our front four hard and have our 5 through 7 within eyesight. We felt that if we did this, our late season training methods would allow us to finish better than how we were finishing during the first half of the season. The boys did execute this plan almost perfectly. No single one runner stepped up, it was a collective effort of doing what they believed through their training. In fact, only one of our runners set a personal record at the state meet. I had a sigh of relief because this season was a bit more difficult dealing with several injuries and other unforeseen challenges. I also felt humbly honored to be able to help these young men achieve success and the state championship was a great symbol of the season's success. Dealing with several injuries to a couple of our top 7 runners. Injuries are a normal part of running cross country, however, the results of these injuries have varying degrees of severity according to when they occur. No time is a good time to be injured but injuries too early in the season during the base building or late in the season can be extra difficult to overcome and this year's team amazingly managed to do so. The collective belief in the program and the supporting involvement of the alumni throughout the season. These guys all believe in each other and the prior team's success helps in that deep conviction. The other keys were maintaing good health for the top runners and a low level of team physical exhaustion helped us prevent that. The low point for the team was our performance at Great American. This was definitely a wake-up call and it created a renewed sense of motivation. The team was able to respond after a slight adjustment to our training program and within 3 weeks they were back on track. Yes, the key moment was the two weeks of workouts after their loss at Great American and at PreState. It was then that I could see the fire in a team that wanted another State Championship. This particular group was interested in preserving a legacy and a tradition more than any other I have coached until now. These guys were made up of runners that had experienced winning a State Championship before, however, they all understood the importance of the notion that you are only as good as your last meet says you are. They couldn't live off the glory of the teams before them, instead they had a responsibility to build upon it and pass it to the next team. This team was very unified upon completion of their summer training and this unity carried them through the season. The team lacked a central leadership but it drew from its cohesive approach to pack training to accomplish their successes. We couldn't do what we do without our assistants. Victor Arrieta, Juan Rodriguez, Carlos Barquin and Rene Medina each have their own unique way of connecting with the guys on the team and this helps tremendously. In addition, I try to make my decisions, both major and minor ones, only after consulting with them. We are blessed to have so many committed coaches, all of which are former Belen XC Runners, who all contribute to form what we call the program. I thank them for everything they do and continue to do to make these guys better runners and more importantly better people. The parents play a role at home and they too complete the package in their own special way. Without their support these kids could not excel at their high level as they help us with everything from their diets to transports to and from workouts. These parents have also helped out with fundraising efforts as it was several of these parents that helped us complete the last phase of construction for our on-campus cross country course. We are very grateful to have such a large committed group of supportive parents as they too make up what we call the program. My coaching style is athlete-centered with the coach only providing direction and guidance based on sound and time-tested principles. As a coach I rely on a constant stream of new knowledge and then combine that with a few years of experience and then execute using my intuition. My style also includes adjusting workouts based on my observations of their progress as well as the feedback they provide. I also do my best to run with them on some of the workouts although that's proving to be more difficult as they continue to get faster. We didn't have one single leader, instead we depended on the different leadership strengths provided by the many seniors on this year's team. Leadership was lacking a bit from a central source, however, these guys get along so well and they tend to listen to their coaches, therefore, not having a leader was not a crucial factor this season. The biggest individual surprise this season was certainly the infusion of the young talent of 8th grader Joshua Collins. His time at State made school history and it also motivated the older guys to get moving for fear of being caught be the youngster. I look forward to seeing what this young runner will become in the coming seasons. This team is among the top 5 teams I have had the pleasure of coaching. This wasn't the deepest team in our history but it was deep enough to help make it all happen. In addition, this team now goes down in history as the first team to win 4 consecutive titles. Every state championship team seems to have a special or unique makeup that makes them state champions. What were some of those characteristics of this year's team? 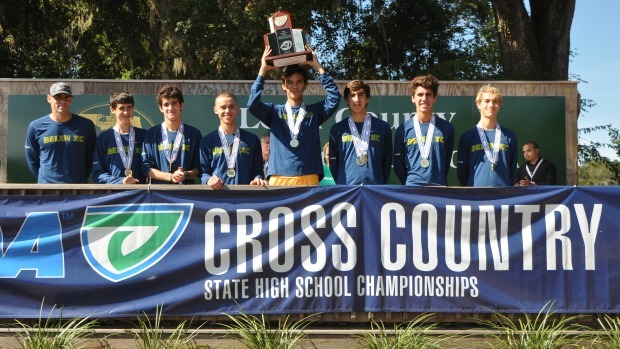 What made this team unique is that it was made up of guys that have been on 4 State XC Championship teams. This presents an interesting dynamic in that it requires additional fuel for motivation and inspiration. They had more poise that any other team I coached, often using their affinity for Electronic Dance Music to get them in a focused frame of mind for workouts and races. My expectations for next season's team will be based on how summer training goes. I expect excellence at all times, however, I will not set expectations for them until we begin to see their level of willingness to work hard towards a State Championship or beyond. Every team is different as each season brings us new challenges and even greater competitors so I prefer to set expectations relative to the actual team rather than simply from the coach's optimistic perspective. We remain humbly proud on what we have accomplished thus far and we look to never take any success for granted so our expectations will reset every year, with that in mind our goal and our intent as a program will be to compete amongst the best next November.